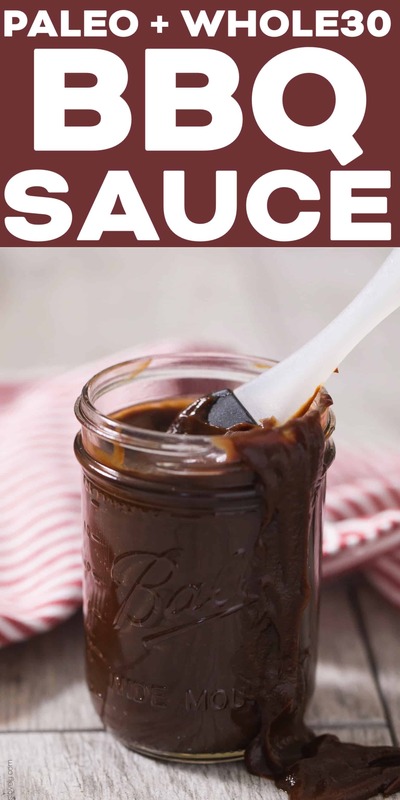 Easy Paleo + Whole30 BBQ Sauce Recipe and Video – a homemade Tessemae’s BBQ sauce copycat. Ready in 10 minutes! 7 ingredients, sweetened naturally with dates, so no sugar! Paleo, gluten free, grain free, dairy free, refined sugar free, vegan, clean eating, real food. You are going to LOVE how easy this Whole30 BBQ sauce is! It is ready to eat in 10 minutes. I’m serious. Now that I know how easy it is to make a healthy, sugar free BBQ sauce I’m never going to buy store bought again. It is healthy, with just 7 easy ingredients you probably already have in your kitchen. Have you read the ingredients on store bought BBQ sauce? PACKED with sugar. 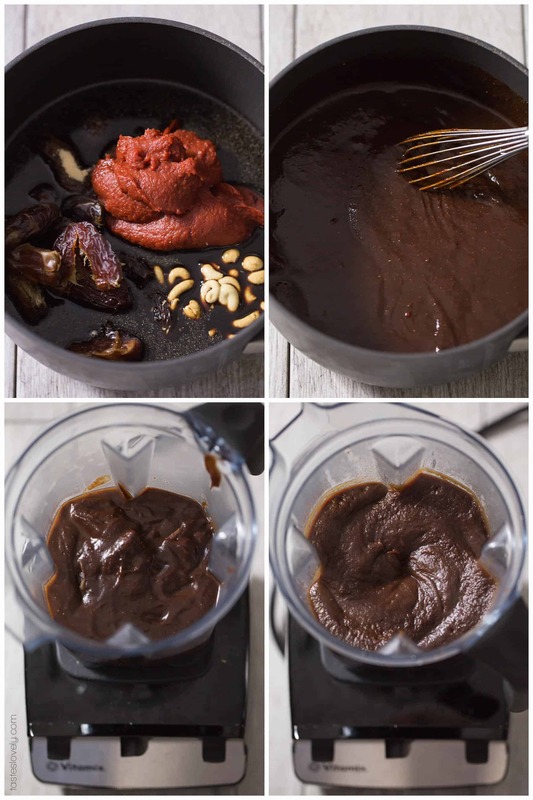 This easy Whole30 and paleo BBQ sauce is sweetened naturally with dates, so no refined sugar. The best part? You can’t even tell it is sweetened naturally. Still sweet and thick and tangy, with the added bonus of being much healthier for you. I went to buy Tessemae’s at the store, and it was sold out! 😱 I asked the Whole Foods manager, and he said Tessemae’s BBQ sauce was out of stock for the foreseeable future, even on their website and Amazon. It is July! I need my BBQ sauce! So I set out to make my own. I read the ingredients on the label of my almost empty Tessemae’s bottle, and tried to recreate it at home. After a few tries, I got it right! 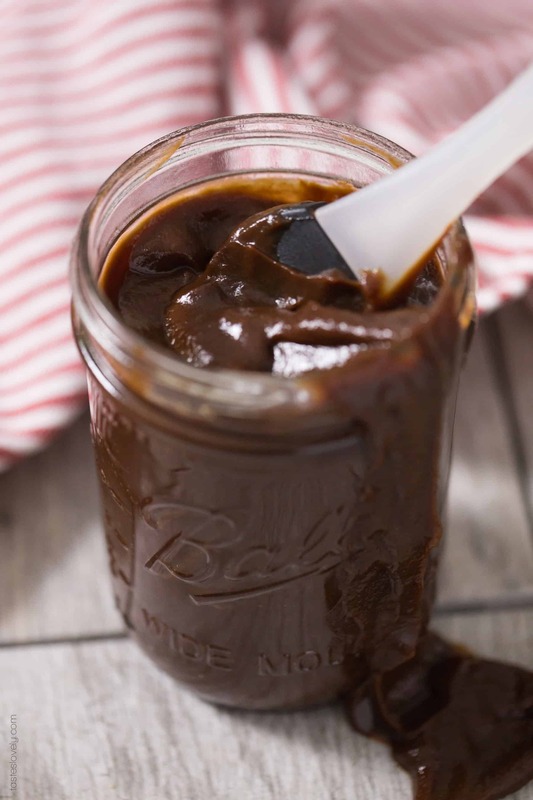 A perfect Tessemae’s BBQ sauce copycat recipe. 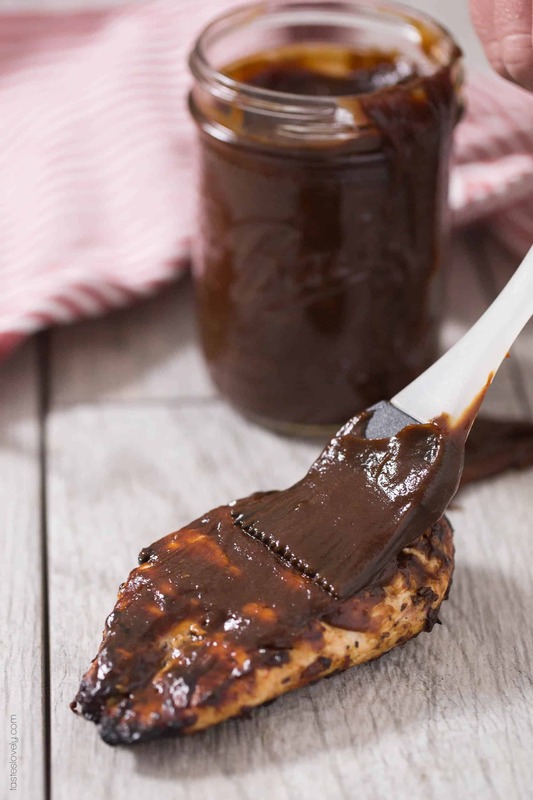 This BBQ sauce is made with balsamic vinegar, tomato paste, pitted dates, dijon mustard, coconut aminos, garlic powder, onion powder, salt and pepper. That’s it! All real ingredients that make it a paleo, Whole30 approved, gluten free, dairy free, refined sugar free and vegan BBQ sauce. I add all the ingredients to a pan to slowly warm so the flavors can marry, and also to get the pitted dates soft and plump so they blend really well. After it warms on the stove for 5 minutes, I add all the ingredients to my blender and blend on high for 2 minutes. When it’s done blending, it’s ready to start eating. It’s that easy. I find that this BBQ sauce is best when it is thick, so when I brush it on meat and grill it, the BBQ sauce really stays on. I hate when it’s too runny and drips off. But this is personal preference. If you like your BBQ sauce thinner, just add water and blend again until it reaches the consistency you like. I store my BBQ sauce in wide mouth pint mason jars. This recipes makes about 2-1/2 cups. I use 1/2 cup right away on whatever I’m cooking, and the rest fits perfectly in the mason jar. I also love using wide mouth pint mason jars because they’re freezer friendly! I like to make a double batch, freeze 2 pints, and leave the rest in the fridge. Heat a sauce pan over medium low heat. Add all ingredients, stir to combine, and bring to a low simmer for 5 minutes. You don’t want it to boil, just get warmed through. Heating will allow the flavors to marry and soften the dates. I like my bbq sauce thick so it really sticks to the meat I grill. If you like yours thinner, add water and blend until desired consistency is reached. Store in an airtight container or wide mouth pint mason jar. Will keep in the fridge for at least 4 weeks, or frozen for 1 year. 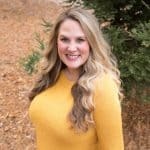 This post contains affiliate links, thanks for the love! BEST BBQ SAUCE EVER!!!! My husband didn’t believe me when I told him this was Whole30. Thank you thank you thank you! I’m pretty sure my Dijon mustard at home has sugar in it. Any suggestions for an alternative? Can I just sub out regular yellow mustard? Yes! You could use yellow mustard! Dijon mustards shouldn’t have sugar in it, so next time you’re at the store check the labels and grab one that doesn’t have sugar. You’re going to love this BBQ sauce! Could this recipe be made without the dates? I am doing 21DSD and looking for an easy bbq recipe that doesn’t include any food for natural sweetner? I love the easiness of this recipe compared to some others! You could definitely try! But it might be really, really tangy. 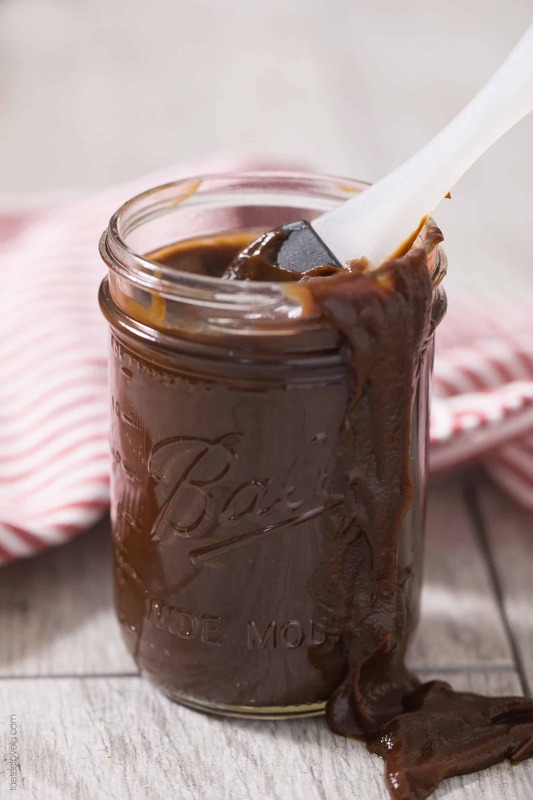 The sweet helps offset the vinegar for a good, balanced BBQ sauce. But hey, it could be good! Can you use fruit? Maybe adding in raw apple would work? I think it will be a lot better with some sweetness added in. Let me know how it turns out if you try it! Not because I wanted to, but because I was out! You gotta have a little bit of sweetness! In addition to all of that I added some heat to my sauce as well, some smoked paprika and cayenne pepper gave it a spicy smokey boldness -yum! Adding in apple is a great idea to sweeten it! Smart since you were out of dates. And paprika and cayenne pepper. My husband loves spicy, I want to try this next time. Glad you liked it! Thanks so much for taking the time to let me know! I’m so glad you like it Casey! You just made my day! Oh my goodness! What delectable yumminess!! We have a group that meets in our home on Sunday for food, fellowship, Bible study and prayer. I’m always searching for recipes that satisfy the non-W30s (which is the entire group except me :D) and this one was a major hit. We’ve had it on BBQ chicken, brisket, sloppy joes…you name it. Even the guys were sopping up the sauce. I am so happy you liked my BBQ sauce! And that non whole30ers liked it too! That’s the ultimate compliment! Thanks for letting me know you liked my recipe. You made my day! I was out of dates so I subbed in raisins and it turned out great! Everyone loves it! Raisins are a great idea Laura! Never thought of that! I’m going to remember that in case I ever run out of dates. Thanks for letting me know you liked my recipe, you made my day! Good to know! Dates are for sure if you can use dates! Makes such a yummy BBQ sauce! Oooh, I can’t think of one off the top of my head! But it won’t be the end of the world if you leave it out. It should still be good without it! Has anyone used an immersion blender for this? I made this tonight and used my immersion blender right in the saucepan on the stovetop. It worked just fine – very convenient. I like the sauce, it’s a bit tart for me, maybe adding a bit more date would take the edge off. All in all, good for my first BBQ sauce! Thanks for sharing Randi! Glad you like the BBQ sauce! Thanks for taking the time to let me know. Yes! I’ve had readers let me know they’ve used an immersion blender for this and it worked great! Just make sure your dates are extra soft so they blend right up. Soak them in hot water for a good 30 minutes and they should blend up no problem. Hope you love it when you try it! Yes! Feel free to add in as many dates as you would like to reach desired sweetness. If you’re not on a Whole30, maple syrup or honey or coconut sugar would work great too. Can you us figs instead of dates? Absolutely! It should be a 1:1 ratio. There will just be the fig seeds inside the BBQ sauce. But should still taste great!